This design is personalised on the cover with a personal or company name but this can be omitted if preferred. 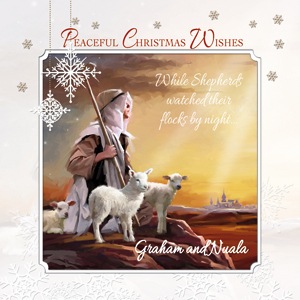 The text "Peaceful Christmas Wishes" can be changed keeping in mind the space provided for replacement text. The verse shall be printed in flat black ink directly on the inside of the card. The card is supplied with a white envelope.